As governments and businesses “connect” and grow, adversaries and competitors are watching and exploiting our “inter-connectedness.” This growing cyber threat, the associated business risk and “what to do about it” are now becoming regular discussion items at all corporate board meetings. It is clear that most companies, Boards and CROs are not prepared to address this challenge. We need to identify executives who understand this threat and can translate cyber threats and proposed corporate response into risk mitigation, business continuity and growth. Finding this executive talent for different corporate cultures is rare. In my experience across government and corporate America, there is none better – in leading this executive search and matching process – than Jeremy King and Benchmark. Bob Butler is the co-founder and managing director of Cyber Strategies LLC. Previously, he served as the CSO for IO, a global data center service and product firm. He has consulted as a Special Government Expert to the Office of the Secretary of Defense, and Air Force Scientific Advisory Board. He also serves as a fellow at the Center for New American Security (CNAS) and is a member of the Texas State Cyber Security, Education and Economic Development Council. Prior to assuming his current roles, Mr. Butler served as the Deputy Assistant Secretary of Defense for Cyber and Space Policy. He was responsible for providing insightful policy advice and support to the Secretary of Defense and other senior Department of Defense (DOD) leaders by formulating, recommending, integrating, and implementing policies and strategies to improve United States Cyber and Space posture. This encompassed DoD policy relating to requirements, capability development, operations, declaratory policy, employment, and international cooperation or agreements. 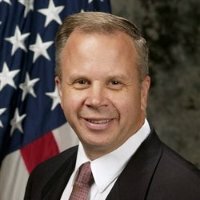 Previously, Mr. Butler served as an Account Executive with Computer Sciences Corporation (CSC), managing Defense Intelligence business with Combatant Commands and Military Services. He managed approximately 200 employees at over ten separate customer locations in the United States, Germany and the United Kingdom. He served as chairman of corporate cyber technical working group coordinating cyber strategies across commercial, international and federal sector market spaces. Mr. Butler is a former member of the Senior Executive Service, and recently was the Associate Director, Joint Information Operations Warfare Command (JIOWC), Lackland Air Force Base, Texas. In this position, he advised the JIOWC commander and US Strategic Command leadership on key information operations issues and opportunities for providing superior support to combatant command and Department of Defense plans and operations. Additionally, Mr. Butler guided the development of JIOWC IO strategies and technologies to enhance mission support. Mr. Butler is a retired U. S. Air Force officer. From December 1979 to August 2005, he served in a variety of intelligence and communications-computer systems positions in the continental United States and Europe at the detachment, squadron, group, major command, unified command, Headquarters Air Force and Office of the Secretary of Defense levels. 1979 Bachelor of Science degree in computer information systems with a minor in Spanish, Manhattan College (AFROTC Distinguished Graduate), Riverdale, N.Y.
1981 Squadron Officer School, Maxwell AFB, Ala.
1983 Master of Business in Administration, University of Maryland, College Park, Md. 1994 Air Command and Staff College (Distinguished Graduate), Maxwell AFB, Ala.
1998 National Defense Fellow, Institute for the Study of Diplomacy, School of Foreign Service, Georgetown University, Washington D.C.
My interaction with Benchmark was a positive experience from beginning to acceptance of the position. They were knowledgeable about the position and market, upfront, very professional, and kept me well informed throughout the process. Even for those not seeking new career opportunities, a relationship with Benchmark is of great value.